Share the post "If One’s Good"
Well, I’m happy to announce that I made it thru the day without any last minute fires to put out on the multiple, and nearly back-to-back closings I had this morning. It wouldn’t have been so bad if they were all at the same bank or closing companies, but unfortunately, they were across town. At one of the closings, I was in near shock when the buyer who was being represented by another agent just happened to say to me, “I think you know my aunt.” When I asked who her aunt was, my jaw dropped when hearing her name, because she and her husband have been dear to me for at least 25+ years. I’m sure their agent was likely squirming in her seat when I started reminiscing about her extended family, as well as how much real estate work I’ve done for them over the years. What was even more surprising, is that the buyer’s husband goes up to Fertile when he’s not working and helps her brother with the cooking at Cafe Mir in Fertile. And as chance would have it, the owner of Cafe Mir is the son of that particular aunt we were talking about. As we were walking out, I told the buyers for sure I’ll be having dinner up there some evening in the near future. Nearly that entire extended family are the nicest of people you’d ever want to meet. I’m no longer envious of the new owners of 217 – 5th St. NW, because I personally know all the many in their extended family. Finding that out today was just another reminder we don’t live in a city, but rather a bloated village. It’s come as no surprise we’ve already received an offer on 665 – 3rd Pl. SE which I just listed. I presented it to the owners, and hopefully we’ll have it sold before the weekend is out. I’ll have to be sure and sketch its floor plan because it would make a good “new build” for someone with a growing family. It has just the right amount of square footage instead of being one of those monster McMansions that have been popular for far too long. I foresee there being a welcome trend arising where people begin realizing they don’t need classic examples of conspicuous consumption we find in subdivisions of our City such as Pebble Creek. I’m hoping for a good turnout of prospective buyers at my Public Open House/Outdoor Barbecue being held tomorrow afternoon at Prairie Place on 1st. It looks like it’ll be a little chilly, but at least we’re not supposed to be getting rain. 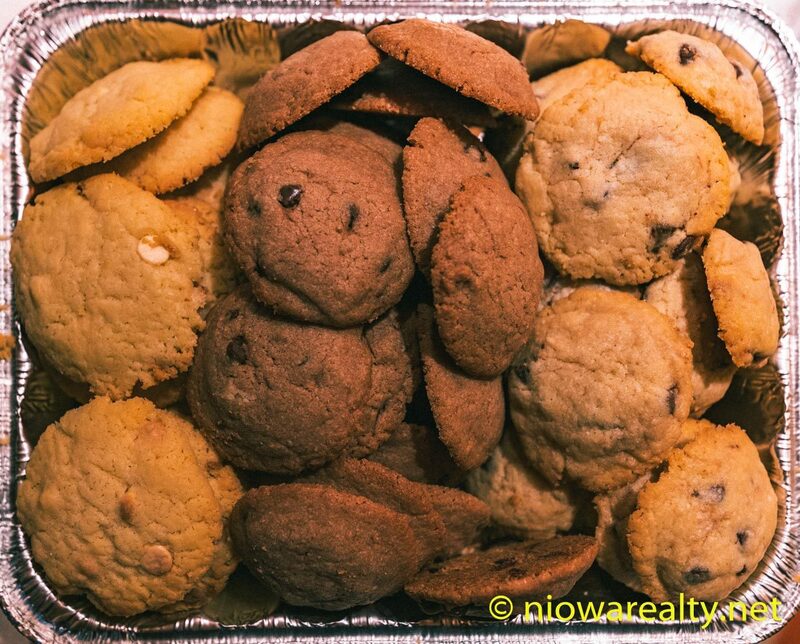 I decided to supply the dessert which will be several kinds of homemade cookies, so if you’re hungry for one of mine, stop by and help yourselves. I can never seem to stomach store-bought cookies which is likely due to my dear mother having spoiled me by nearly always supplying me with a half dozen of her weekly baking of cookies. Whenever she’d try to force more than one on me while there, I’d remind her how much she reminded me of her mother/my grandmother who’d say, “If one’s good, then two should be better.” In spite of them both having returned to their maker, I’m poked on a near-daily basis with the most delightful thoughts of them. One thing I want each and every one of you to remember is, “Do not ever, and certainly never plug yourselves into a reverse mortgage on your homes!” I’m trying to get a home sale ready for closing, and this is the fourth or fifth time I’ve had to fight with a reverse mortgage company simply to get a letter of payoff. And of course each and every one of those past sellers were sorry they did it. I still can’t believe our Federal Government allows such mortgages to be made, because as far as I’m concerned, they’re not in the best interest of homeowners. And again, please do not even think about taking one out because you’ll likely hate yourselves in the end for doing it. I can’t think of a better way of eating up hard-earned equity on a home. Tonight’s one-liner is: Nearly all men can stand adversity, but if you want to test a man’s character, give him power.